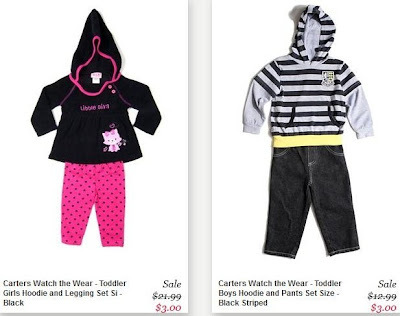 Carter's $3 Blowout Sale! Entire Site is $3! Wow, for a limited time, almost everything on the Carter's Watch the Wear site (except "big kids") is only $3.00! Shipping is a flat rate of $10 no matter how big. You can get 2-piece outfits, onesie sets and much more for only $3!